A super-elastic hero? That's a stretch. Ralph Diby created a consumed a highly concentrated version of the rare Yucatan "gingo" fruit, which granted him the powers of extreme elasticity and malleability. Known as Elongated Man, and a model member of the Justice League of America, he was unprecedentedly open to he public about both his secret identity and loving marriage. Tragically, his wife Sue was murdered by Jean Loring, ex-wife of The Atom, Ray Palmer. News of the murder rippled throughout the community of masked heroes, shaking The Justice League to its core and irrevocably devastating Dibny. Wow, we know this is the collector-oriented toyline, but really? A summary of Identity Crisis on the back of the box? Yes, it was one of the best stories DC published in the '00s (no matter how much fanboys love to run it down), but it's not exactly toy-friendly. It's also not like that's the only thing that's ever happened to him, either. The character was around for 44 years, and yet the only event of note happened eight years ago? That seems unlikely. How about the fact that evey year on Ralph's birthday, Sue's gift was a custom mystery for him to solve? That's awesome! It wasn't until opening this figure that I realized how much this version of Elongated Man's costume looks like Plastic Man - the red belt, the lined yellow belt... it's all very similar. Why did Mattel go with this look, rather than the more distinct purple and white one? Well, probably because DC told them to, but that still doesn't answer "why." On a perhaps related note, editor Julius Schwartz said that if he'd realized DC owned the rights to "Plastic Man," he never would have given this character such an awkward name. 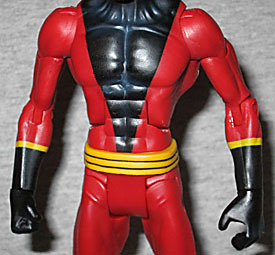 The figure uses the "skinny male" DCUC body, but for some reason he doesn't get the double-hinged elbows and knees. Again: why? The guy's literal superpower is that he's ridiculousy flexible, and yet Mattel cheaps out on the articulation. It's like they don't even know what they're making. The neck should perhaps be a little longer - or at least, the head should have been sculpted to sit up higher. In Identity Crisis, artist Rags Morales based many of the characters' faces on real people - Ralph was inspired by comedian Danny Kaye. There's no such influence here, though the face is still good. There's something about the sculpt that's reminiscent of Gold, so he'll fit right in with the rest of your DC figures. Sadly, his nose is normal, not the trademark "I smell a mystery" twitch. Which wold have been hard to sculpt, sure, but this is the Four Horsemen - if anybody can do it, it'd be them. Something like Mercury, possibly? 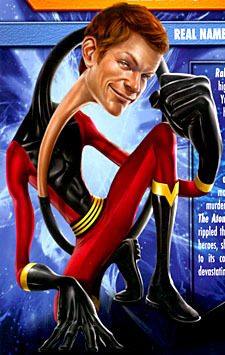 We may not get a cool nose, but Elongated Man is not without accessories. 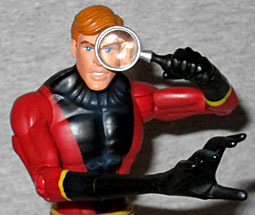 To begin with, there's a magnifying glass that's actually convex, so it slightly magnifies whatever is seen through it - shame that the only way to get it up to his eye is with a pose nearly as stupid as Eclipso's. Then, to simulate his powers, he comes with a second hand that's slightly larger than the normal hand. It swaps out at the wrist, and is easy to pull free. A shapeshifting character means Mike Thompson gets to go a little nuts with the portrait on the back of the box. No standing around looking staid for Ralph Dibney, no sir! He's kneeling on the ground, possibly having just looked up from examining some clue. One hand is splayed in front of his knee, and he's lifted his heel up so just his toes are on the ground. His left hand is a fist. All of that sounds normal enough, but remember: stretchy hero. All his proportions are wildly exaggerated. He has fewer solid surfaces than Salvador Dali's clocks. His neck stretches around his left arm, behind his back, under his right arm and way up close to the "camera," making his face half as big as the rest of his body. It's a totally fun piece, which isn't something we often get to say. Elongated Man isn't as cool an action figure as he could be, but at least this one isn't based on the art of Michael Turner, and that fact alone is enough to say that Mattel's toy is better than DC Direct's.